One of the things I wish I’d learned first, but which I’m actually still learning a lot about, is the divisions between types of kids books. At the end of today’s post, there’s a great resource you should apply to your work. The resource I’m planning to include in part two I like even better. Board books: Fewer pages, thicker cardboard than picture books. Meant for younger than 5 years old. Picture books: Generally 32 pages long. The words and pictures work together to tell the story. So those are the categories. Got it? No! Bad! Stop thinking in boxes!!! The truth is that there’s a lot of overlap, and a lot of books that purposely defy category, even in the examples above. There Is A Bird On Your Head looks a lot like a picture book. The 13-year-old narrator of The Reluctant Journal of Henry K. Larsen sounds closer to middle grade than an older young adult protagonist like Katniss Everdeen. There’s a whole category of books called high/low designed for teens who are weaker readers. They use simpler vocabulary and sentence structure, but deal with age appropriate themes. Orca Soundings makes a bunch of these, with topics such as violence, sexuality, race, etc. The boundaries are soft, and there’s a huge variation within each, but it’s important to know which market you’re writing for. Here are a few things to keep in mind: level of language, subject matter, and word count. I, Nate the great detective, was weeding in my garden. My dog Sludge was digging in it. Oliver came over. Oliver always comes over. Oliver is a pest. I have just lost a weed,” he said. “I believe it,” I said. Mr Dursley was the director of a firm called Grunnings, which made drills. He was a big, beefy man with hardly any neck, although he did have a very large mustache. Mrs. Dursley was thin and blonde and had nearly twice the usual amount of neck, which came in very useful as she spent so much of her time craning over garden fences, spying on the neighbours. 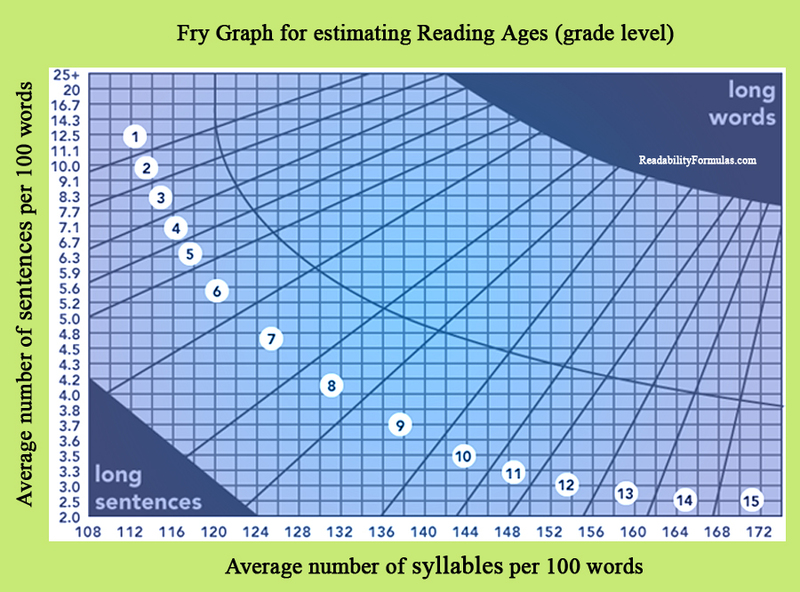 To figure out the reading level, I used the chart below. It uses a combination of sentence length and word-syllable length. This chart does not include abstraction and metaphor, although I feel those are a key part of a passage’s difficulty. My gut feeling used to be that younger readers would have more difficulty visualizing the action, so they used pictures. Following that train of thought, for a while I assumed that middle grade novels should use more concrete description, and I sometimes avoided metaphor in describing characters or fantastic locations. I’m happy to announce this doesn’t seem to be the case. Fantasy books often give bare descriptions of their creatures, and this doesn’t seem to cause problems. For example, the troll in Artemis Fowl is never given a clear outline. He’s just horns and hooves and a general impression of size. If the troll is difficult to visualize, that’s not necessarily a bad thing. Your brain is forced to imagine SOMETHING, and the fact that it’s a murky image, unclear except for a sense of imposing stature, is just fine. Next post will continue exploring kinds of kids’ books, looking into subject matter and word counts. What’s the most awesome part of your story? Do more of that. What’s the least fun part of your story? Do less of that. I remember the epiphany of sitting in a workshop when people told me that they wanted more of the cool part of my story. Or all that boring stuff at the beginning that I thought I needed to “set up” the cool part. They didn’t want that at all. And you know what else is awesome? Usually the awesome part that you get to make longer is the fun part to write. Today, a dragon has followed Eric home from school. He wants to keep it, but his parents might not let him. The most boring way to continue the story would be to have Eric tell his parents about the dragon and to then try and convince them about how he’s responsible blah blah blah. Especially for picture books, stories are told through action. What’s something awesome he could do with the dragon to SHOW that he’s responsible? Or maybe he wants to try and hide the three-hundred-foot-long-lizard under his porch. Whatever he tries to do, zoom in, and make that moment longer. Maybe come up with six or seven ideas, choose the coolest one, and then go crazy with it. The farther you go, the cooler it might become. You can always reel it in afterwards.